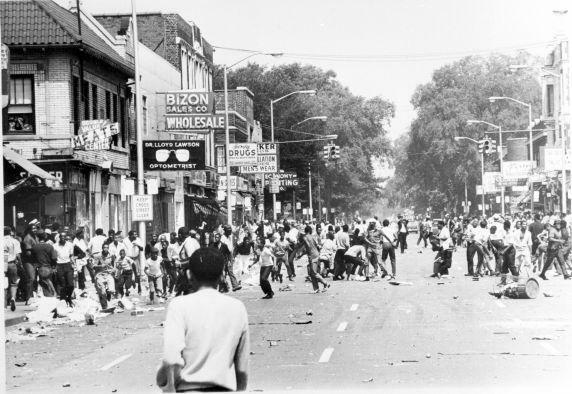 Forty-five years ago this week, Detroit erupted into five days of racial violence that left 43 people dead, more than 450 injured, and thousands of buildings burned and looted. Many people are still trying to get a handle on what that event really signified—and what to call it. Dan Krichbaum clearly remembers the scene from 1967 as he drove from Ann Arbor to southwest Detroit, where he headed a small Methodist congregation. Kirchbaum calls it a “civil disturbance.” He says just calling it “the riots” suggests black Detroiters had no reason to be angry. Kirchbaum says how we talk about 1967 still matters, because Detroit is still grappling with so many of the issues underlying that violence today. There’s no doubt the 1967 unrest left lasting scars that the city has never recovered from. But it also drove a greater desire to understand and deal with the region’s deep-seated racial and social polarization. In 1968, two Detroiters, Eleanor Josaitis and Father William Cunningham, started a non-profit group to address the racial discrimination and lack of opportunity underlying the violence. They called it Focus: HOPE. William Jones is the CEO of Focus: HOPE today. He says while some things have changed for the better, many Detroiters remain trapped without a sense of opportunity. Since its inception in 1968, Jones says Focus: HOPE has provided more than 12,000 people with in-demand jobs skills. About two-dozen people learned Wednesday would be the last day of their Information Technology certification course at Focus: HOPE. Some were nearly in tears, and most were reluctant to leave. In all, about 225 people face an abrupt end to job training courses like this one. That’s because of Congress’s inaction on the Workforce Investment Act. Eleanor Josaitis, a community leader who co-founded the social services organization Focus: HOPE in the wake of Detroit's 1967 riots, has died. She was 79. Her son Mark Josaitis tells The Associated Press that she died Tuesday morning at Angela Hospice in Livonia after being diagnosed last year with cancer. Mark Josaitis says his mother "really believed in human dignity and helping people develop skills to be proud of." Eleanor Josaitis and the Rev. William Cunningham founded Focus: HOPE in 1968 following the race riots that widened a rift between Detroit's black and white residents. The group offers job training, as well as food programs for the poor and elderly. Cunningham died in 1997. Survivors include Josaitis' husband of 55 years, Donald. The couple had five children and several grandchildren.